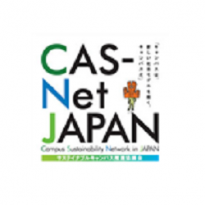 The Campus Sustainability Network in Japan (CAS-Net JAPAN) was established in March 2014 to develop cooperative ties among Japanese universities, thereby keeping up with well-organized environmental initiatives being promoted at an accelerated rate by universities around the world, especially in Europe and the US, and the global trend toward inter-university collaboration. CAS-Net JAPAN aims to share experiences of universities and other institutions that have been conducting environmental activities in various parts of Japan, whether extensively or locally, to further promote such environmental initiatives, in conjunction with encouraging information exchanges in versatile ways and providing venues for relevant institutions to act in unison. In addition, CAS-Net JAPAN hope to connect closely with networks of universities overseas engaged in environmental activities, work together proactively to achieve our goal of creating sustainable campuses, and eventually broaden the base of our activities in society.